Gil Griffin is a writer based in California. He fell in love with Australian footy, and the Dockers, and has recently published his book Jumping at the Chance: From NBA Hopefuls to AFL Prospects. Gil recently visited Australia with his Swans supporting wife Arlene. He braved the elements at the MCG for Collingwood v Freo, and then headed to the SCG for the Swans-Doggies fixture. He wrote this, a version of which was published in Inside Football. If offered a choice beforehand, of watching their favorite footy club from either the comfort and shelter of the MCG’s Olympic Room, with fine food and free-flowing beer on offer and a raft of luminaries to mingle with, or the first row behind the goalposts in a chilly deluge of rain forming puddles around your feet and a swirling wind icing your bones, what do you reckon most footy fans would go for? Oh, did I mention that during the course of the night, the club in question would score just a solitary point in the first quarter on its way to getting belted by 48 and was playing a match easily enough watched from home, on free-to-air national television? But — and not to brag here — I’m not most footy fans. 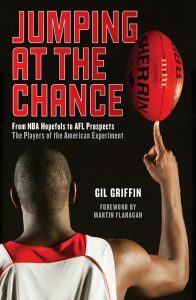 I’d come all the way from the United States for two weeks, to promote my new book, Jumping At the Chance: From NBA Hopefuls to AFL Prospects, the Players of the American Experiment (Nero/Black Inc. Books) — about the AFL’s first-ever born-and-bred American players. Only slightly less importantly, though, I wasn’t missing a chance to see my beloved Fremantle Dockers in person, in this Friday Night Footy clash against Collingwood. When I learned of the book’s Monday 27 June release date, then checked Freo’s fixture, I booked my 15 1/2-hour nonstop flight from my hometown, Los Angeles, so I’d arrive match-day morning. My loyalty to Fremantle goes back 14 years and the club’s dreadful season and this night’s insipid performance surely was the case of the footy gods testing it. I’ve been footy obsessed since 1999, when I made my AFL debut in Rd 1 at the SCG — the same match in which Swans’ legend Adam Goodes made his — in the press box, watching Port Adelaide defeat Sydney. Shortly afterward, the Swans gained a new fan — my new girlfriend, an American woman to whom I’d introduced the game, who admired superstar Tony Lockett. Now fast-forward four years, to 2003. That new girlfriend? She’s now my wife. And we’re sitting on the couch in our San Diego home and we’re watching a televised Western Derby match. Fremantle must defeat their hated rivals, West Coast, to claim its first-ever Finals berth, after seven years of futility. It’s often said that people subliminally choose their life partners based on the character traits of one or both of their parents, because it feels comfortable and familiar. Maybe the same is true of sports fans, because I felt myself barracking for Fremantle in this match because of my lifelong passion for Major League Baseball’s New York Mets. Think about it: the Mets have lost more often than they’ve won and like the Dockers, are greatly overshadowed in their home port by a much more successful and longer established rival — the Eagles to the Dockers are like the Yankees to the Mets. Freo had some familiar faces in this match: I’d randomly met Peter Bell in 2000 in Melbourne’s CBD when he was a North Melbourne Kangaroo (16 years later, he’d write praise for my book in its first pages) and at that year’s Grand Final. I’d met family members of then-Melbourne Demon, Jeff Farmer. I’d also remembered Matthew Pavlich, whom I’d seen play that year in a match at the Gabba. But it was Paul Medhurst who made the biggest impact. When he snapped the sealer across his body from the forward pocket, he couldn’t have known it, but with his goal and exuberant celebration, he sealed my heart. From that moment, I’ve never looked back. Massive time difference be damned, I watch every Freo match live from the U.S. and even call into the 6PR radio talkback show after matches. When the Dockers made their maiden Grand Final appearance in 2013, I flew down for it. So for this Friday night match, while I did make the rounds at a lovely Collingwood pre-match function, shortly after the opening bounce, I’d broken out my purple Dockers rain jacket and scarf and was in my natural habitat, with my mates in the middle of the club’s Victorian cheersquad, some of the hardiest fans you’ll ever find. A week later, I fulfilled a promise to my wife, Arlene. I proudly escorted her to the SCG, where my AFL journey began, so she could see her Swannies for the first time, in a thriller against the Western Bulldogs. We sat behind the goals in the Churchill Stand and she was outfitted in a brand new, red Swans jacket and matching supporter cap. It was warm and dry and we were treated to a glorious sunset over the city skyline. The Swans kicked a higher score in the first half than the Dockers did in their entire debacle against Collingwood. Although the Swans would lose on a dying minutes set-shot by Jason Johannisen, Arlene and I giddily enjoyed a post-match kick-to-kick on the ground. My wife has experienced something in her footy journey I desperately long for. She has shed tears of joy, watching the Swans in 2005 and 2012 hoist the cup on Grand Final Day. I, like most Freo fans, am eternally hopeful. So I dream on about the boys lifting up a purple-and-white trimmed cup on the Grand Final stage. For now, I keep taking blows for the team, knowing one day I’ll again be shoulder to shoulder with my Purple Army mates, watching our club take out a flag. great story Gil, look forward to reading your book.